CBC News article "Forgotten flags - a rare peek at what might have been"
A design was suggested by the newspaper La Presse in the 11 January 1930 edition of La Presse Montreal. Some years earlier the winner of a Manitoba Free Press Competition had been a white flag, Union canton, with blue five point stars making up the Great Bear in the lower hoist and fly, and a larger North Star near the top of the upper fly. There was no illustration, only the above description which is open to different interpretations. I suggest it is more likely that the North Star and the Great Bear would have been in their correct relative positions; i.e., the two right hand stars of the Great Bear and the North Star in line. Also there is no indication that the North Star had more than five points. Why shouldn't we Canadians, like the Australians, have a distinctive flag, instead of the makeshift of the British merchant marine ensign, with the Dominion arms in the fly? . . . The seven stars of the Dipper would make a fine Canadian flag. The field, of course, would have to be some other color than the red of the Australian flag, on which the five stars of the Southern Cross shine in white. This is a copy of the flag proposal put forth in 1939 by Ephrem Cote. He wrote a book promoting his flag, called Project of a Distinct National Flag for Canada . It seems like most of the submissions were based on the red ensign, but this is different. I have been reading through "Canada's Flag - A Search for Country" online. It is proving to be absolutely fascinating. On page 4m ( http://www.schoolnet.ca/collections/flag/html/ch4m.htm ) I discovered some proposals which are not shown on FOTW. Here is the text that applies. I have added the file names of the images after each relevant description. Beaudoin still pleaded for some measure of compromise. He was prepared to accept the Union Jack in the first quarter provided that part or all of the background was white. It was, incidentally, a design which had been suggested by the newspaper La Presse in the I930s.38 The white background on the flag would symbolize the history of the first period of Canada, the heroic period wherein citizens of French origin played such a great role. Interestingly enough, Beaudoin's suggestion won support from J. M. Macdonnell, a prestigious Toronto Conservative, and from Senator Reid, a Liberal and Scottishborn Presbyterian from British Columbia. Even G. G. Hansell stated that he had no objection to a little white and in fact wished to see some white, somewhere, perhaps a white maple leaf! For a short while it seemed as though some compromise might be achieved, possibly in the form of a variation of the naval white ensign. The protagonists appeared to be withdrawing from their hard positions. It fell to John R. MacNicol, member for Davenport Toronto and past president of riding, city ward, provincial and dominion Conservative associations, to bring the dreamers to heel. He would have nothing less than the Red Ensign and said so in terms that left no further hope for compromise. His only concession would be a maple leaf on a white background instead of the Coat of Arms. That this committee recommend that the national flag in Canada should be the Canadian Red Ensign with a maple leaf in autumn golden colours in a bordered background of white replacing the Coat of Arms in the fly, the whole design to be so proportioned that the size and position of the maple leaf in relation to the Union Jack in the canton will identify it as a symbol distinctive of Canada as a nation. These descriptions are pretty vague, so I had to do a little creative interpretation. Comments are, of course, welcome. We actually have a yellowing old poster on the wall here in the High Commission (ie., intra-Commonwealth Embassy) showing this flag. The maple leaf is a natural ("proper"?) sugar maple leaf, with somewhat sweeping (curved?) edges, vice the straight, geometrically-balanced "stylised" maple leaf of the current (post-1964) flag. The current stylised maple leaf was a creation of the 1964 flag debate; hence the maple leaf on any pre-1965 Canadian flag/arms should be natural. In Chris's initial posting on the subject he referred to gold. This is the "natural" colour finally proposed in 1946, (and the one in the poster I referred to). As I'm sure we have discussed before, prior to c. the mid-1950s the preferred option was for a green maple leaf; then, slowly, the preference changed to a red one. This transformation was reflected most obviously in the colours of the sprig of 3 leaves portrayed in the bottom compartment of the shield in the Canadian coat of arms; but not exclusively -- Her Majesty's Canadian Ships adopted a green maple leaf (as a distinguishing mark), c.1943, and affixed it to their funnels. These were slowly repainted to red in the late-1940s/early-1950s, and after 1965 all new ones were the stylised maple leaf. This flag was suggested by Ad�lard Godbout (Premier of Quebec in 1936 and from 1939 to 1944) in 1947 for Canada. 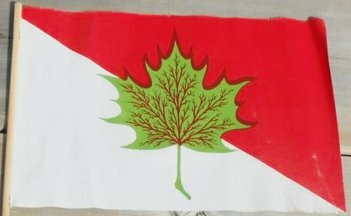 It was the flag of the League of the Canadian Flag : diagonally divided from upper hoist to lower fly, red over white, with a centered green maple leaf. Ironic twist of faith... The most important national symbol of Quebec wouldn't have been adopted at that time if the Federal would've been more nationalist! (In the Canadian sense, of course). Here is the first part of an article on the front page of the (Toronto) Globe and Mail for February 4, 1955. Ottawa, Feb. 3 (Staff) -- An old cause got a new champion today. The cause was the adoption of a new Canadian flag, and the champion was A. H. Hollingworth (L, York Centre), a 36-year-old lawyer who was elected for the first time in 1953. Mr. Hollingworth introduced in the Commons a bill asking the secretary of state to bring in a design for a distinctive Canadian flag which would be acceptable to all Canada. The Toronto area member believes he has such a design. Mr. Hollingworth's flag would have the Union Jack in the upper left corner, next the staff; it would have a white ground and on the fly there would be a red or green maple leaf. Outside the House, Mr. Hollingworth said he was convinced the Union Jack was essential if the flag was to find acceptance in English-speaking Canada. The white ground, he hoped, would appeal to French-speaking Canadians. The red or green leaf -- the color would be decided on aesthetic grounds -- would be equally appreciated by both. Seconder for Mr. Hollingworth's bill was Bona Arsenault (L, Bonaventure), an old campaigner for a new flag. Mr. Arsenault last session introduced his own flag bill, but it perished on the order paper. (L means Liberal, of course. The rest of the article is about generalities, such as the need for broad support for any new flag and how the House of Commons grants only a brief time to a private member's bill, rarely even voting on it.) I came across this accidentally while reading something else on the same page, so I don't know if there were any other articles about this bill or Arsenault's proposal of, presumably, 1954. On April 27, 1955, on pages 1 and 2, the Globe and Mail ran a story about another Canadian flag proposal. This one was designed by J.W. Bradfield of the Toronto Young Men's Canadian Club, and it was hoped that the club would officially sponsor the proposal and other Young Men's Canadian Clubs across the country would promote its adoption. However, the Canadian Club, the parent body of these clubs, might not consider it advisable to get into such a controversial issue. Prime Minister St. Laurent was shown the design and his reaction was said to be enthusiastic. The design consisted of four quadrants, something like Panama's, but with red in the upper left, blue in the lower right, and the other two white. The red quadrant would feature three lions couchant, the blue one three fleur-de-lis, and each white quadrant, three red maple leaves. "However, at the moment the House has still to deal with a private bill introduced by A.H. Hollingworth (L. York Centre), which would require the Secretary of State to select a suitable national flag, submit it to the cabinet for approval, and report to Parliament 30 days after the opening of the next session. This procedure for determining a national flag would provide an avenue for the Toronto Young Men's Canadian Club plans." "I would like to congratulate Senator Jean Francois Pouliot on his design of the new Canadian flag. I think it beautiful. As it is free from any European emblem it should suit all Canadians." I found this accidentally while searching for something else. I did a Globe and Mail search for "Pouliot" and "flag" starting about 6 weeks before this date, but the quality of ProQuest's OCR is so bad that it not only did not find the letter I had read, but it did not find any hits at all until July 4, 1957. Toronto (CP) -- Jean-Francois Pouliot, Liberal member of Parliament for Temiscouata, said Tuesday night the time has come for a "distinctive and official" Canadian flag, bearing only one emblem, the maple leaf. Speaking to the Toronto junior board of trade, he said the Union Jack could fly alongside a new national flag but should not supersede it. "Too many English-Canadians continue to be more British than Canadian and reject every project for a standard that does not include the Union flag", he said. Senator Jean Francois Pouliot took another whack at one of his favorite subjects Sunday night -- the Canadian flag. In a good-natured talk to some 300 attending a St. Jean Baptiste Society "French Night" Sunday evening he kept St. Jean Baptiste parish hall reverberating with laughter. Spreading the Red Ensign over his broad chest, Sen. Pouliot pointed to the lions which form part of the Canadian crest. "Can you see this?" he shouted at the audience. "No, of course, you can't. The lions aren't even as big as squirrels." Then he recalled that at one time there was a dispute as to whether the lions were really lions or whether they were leopards. 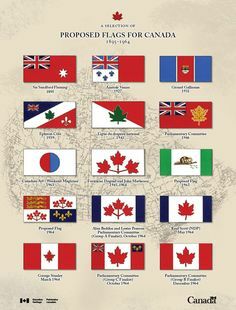 Sen. Pouliot's point was that very few Canadians -- let alone people of other countries -- know what the symbols of the present Canadian flag mean. "The Red Ensign is an insult to the Union Jack", he exclaimed. "Look at it. The Union Jack, which I consider one of the most beautiful flags in the world, occupies only a quarter." The grey-haired senator with the mischievous twinkle in his eyes made plain his respect for the British flag but added: "It is the emblem of another country." Later he said: "I am not anti-British. I'm pro-Canadian." He had a Union Jack, a Red Ensign and a third flag -- a green maple leaf on a red field -- standing on the desk where he was speaking. He reached over for the third one. "This one", he said, "would be recognized in all parts of the world as the noble emblem of Canada." Then seizing the Red Ensign once more, he added that its insignia were little more than a "cabalistic" mystery to most. A distinctly Canadian flag, he said, would do much to increase respect for this country amongst Canadians and amongst people of other nations. So this would be like the 1947 proposal above, only with the red extended to replace the white triangle. One of the difficulties Canada's multitude of self-appointed flag designers run into is that they allow themselves to become entangles by rule instead of striking out boldly. They think in terms of heraldry and symbolism, and that can be fatal. Consider Ottawa's new coat of arms, for example: it is brimming with symbols of the past, present and future; it is no doubt heraldically correct; it is fascinating to behold; but few will deny that it is a conglomeration of objects. The same thing happens with the average flag designer gets out his box of crayons. He finds he must put in something to show the British connection and also New France; then he muses on the seas at Canada's gates and designates these by two blue wavy lines, only to remember that a third sea is of growing importance in the nation's life; and that in turn leads to thoughts of the boundless North, which must be symbolized by a white square, or something. And so it goes. Senator Jean Francois Pouliot, however, will have none of this. Senator Pouliot has also turned his hand to flag-making. More than that, he flies his flag from his home at Riviere du Loup, much after the fashion of a baron of old. The point about Senator Pouliot's flag is that it by-passes nearly all the available symbols. It consists of a green maple leaf on a solid red background. Why red? "Because red is flashy; it can be seen from far away." And why green? "Because Canada is a growing country." Perhaps this is not the design that most Canadians will eventually agree upon for their own flag, but Senator Pouliot has at least shown how to throw off the shackles of symbolism. Senator Jean-Francois Pouliot proposes that Canada adopt a national flag consisting of a large green maple leaf on a red background. The Quebec Liberal senator made the suggestion in a notice of motion presented in the upper house Monday night. The motion, scheduled for debate Wednesday, said: "Canada should have a distinctive national flag consisting of a large green maple leaf (the color of the House of Commons) as the national emblem of Canada, on a red background (the color of the Senate) without any other emblem of any kind on the fly of the flag." Outside the Senate, Senator Pouliot said is the color of the House of Commons and red the color of the Senate. The Canadian Red Ensign now is used for all practical purposes as Canada's official flag. After this the story fades out -- there's one more story two days later, which doesn't really add anything -- so I assume that the motion met with the usual fate of private members' bills, and Pouliot just went on speaking about it to audiences as suitable opportunities occurred. Proposal (from the beginning of the century) for a Canadian flag by John-Guy Labarre in 1962 : it has the polar star. This is the second Quebecois proposal for a Canadian flag that I mention. I have an unusual flag which looks like it's a combination of three flags, British, Canadian and US. The background is like the British flag without the diagonal stripes, there is a green maple leaf in the center and there are three stars on either side in the red stripe and two stars on either side in the vertical red stripe. It took some searching, but a flag matching the description can be found on p.74 of Archbold's I Stand For Canada [abd02], in the photo of the Flag Committee (along with hundreds of other designs). At the top left, the bottom of the flag can be seen just behind the Pearson Pennant, and directly above the head of John Matheson, Prime Minister Pearson's right-hand man on the flag issue. The colours and design seem to match, the centre is not visible. The stars on the lower arm of the cross (the only stars visible) are "points-down", and the width of the cross and fimbriation are rather wide. (There is a second edition of this book which may have different page numbering or include different photos). Apparently there is a flag that looks like the Canadian flag, but with blue stripes. ... What was that flag? There have been a number of replies to this inquiry that more or less answered the question. The white flag with the triple red maple leaves on a single stem, and blue bands at either end of the field, is called the "Pearson Pennant" and was designed [but see writings by Matheson - ed.] by that Canadian Prime Minister subsequent to the Anglo-Egyptian difficulties over the Suez Canal in the late 1950s. Seems the Canadians were offered as "peace-keepers" but the Egyptians objected, saying (in reference to the Canadian Red Ensign) "Look at the Union Jack in their flag and you'll see that Canadians cannot be objective." That really kicked the Canadian flag issue into the forefront of public debate, culminating in 1965. Nick Artmovitch provided more information than I had regarding the history of the "Pearson Pennant", but I stand by my opinion about its superiority to the current flag. Its blue stripes at hoist and fly are unmatched as a fit of words ["A mari usque ad mare"] to pictorial representation, and this inclusion of blue incorporates an important color of French flags into a Canadian one. I have been working through the contributions to you web page on the flag and been struck by how much is forgotten so quickly. I thought I might refer people to a book by somebody who really knows. John Matheson was probably the most important figure in the design of the flag. In the drive for a flag he gives full credit to Prime Minister Pearson; indeed, at times his remarks about Pearson border on hagiography. However I think the book is close to being exhaustive on the subject. There you will find the answers to colours, including shade of red, three vs. one leaf, size and shape, and the incredible work just to secure a dye that wouldn't fade in 30 days. What I found most lacking in the book was any discussion of an ensign for the armed forces [they were unified by then]. Nor is any consideration given to a separate flag for the merchant marine. I feel we missed a real opportunity then. Upon re-reading the book recently I thought to write Mr. Matheson and ask him about this, but he would be 82 years old now and I am not at all sure he is still alive. The ultimate source for the proposals would be the Canadian National Archives. Having tried that, I found a proposal by A.Y. Jackson which indeed matches the description: "a design involving a maple leaf red white and blue". It has narrow red hoist and fly wise borders, but its top and bottom borders are wavy blue. Here's a political cartoon from the early 1960s about changing the Canadian flag. I believe it's from the Toronto Star. Originally it was black & white; I just coloured the flag. There are four politicians in it: Prime Minister Lester Pearson (LP), Former Prime Minister John Diefenbaker (PC), Tommy Douglas (NDP) and the leader of the Quebec-based Social Credit party. 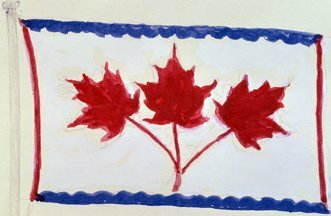 Pearson wanted a pure Canadian flag with no connection to the mother nations. Diefenbaker wanted with connection to our British Founders. The Quebec leader wanted connection to our French roots. The artists at that time had field days with this.